Clifton Fadiman (1904-1999) may not be a household name in many American households today, but he was just that in the 1950s. For millions of American families in that decade and into the early 1960s, including the one I grew up in, Fadiman was known as a popularizer of what might be termed “high brow” culture. I remember well his “Lifetime Reading Program” striking terror in my young heart. My family regarded the Lifetime Reading Program as an early version of what we might today term a readers’ bucket list: a list of 100 books, most of which seemed long and boring, which you were advised to read before you died if you wanted your friends and neighbors to consider you a “well-educated” person. The list ranged from Homer and Thucydides to Herman Melville and Mark Twain, and even had a few 20th century entries. I was in my teens when the 1950s ended, and was convinced that I would never get through many if any of the books on the list, even with what seemed then like an unlimited amount of time before me. But Fadiman was far more than just the man behind the Lifetime Reading Program. While still in his twenties, he became an editor at Simon & Schuster, a major New York publishing house; and during much of the same time was also chief book critic for The New Yorker. He helped establish the Book-of-the-Month club, a mail order subscription service designed to present high-quality new books to the reading public. Fadiman became a well-known radio personality in the 1930s and 1940s as the witty host of a literary quiz game, Information Please. In the early television age, he became a familiar face on several talk shows. He was the author of numerous anthologies on a wide range of topics, taking particular pride in The World of Children’s Literature, an anthology designed to introduce young readers to good literature. In retrospect, Fadiman appears as a groundbreaker in post World War II America in encouraging serious reading and thereby democratizing high culture. When he died in 1999, the New York Times in its obituary wrote that Fadiman’s presence in and influence on American intellectual life had been “ubiquitous. He prided himself on his skill as a popularizer and on his ability to make lofty subjects accessible to people who lacked his education and acuity.” Although to my very “middle brow” family Fadiman appeared to be at the pinnacle of the highbrow cognoscenti, some high brows derided him as a vulgarizer who distilled and diluted high culture to make it palatable to Middle America. As we learn in his daughter Anne’s memoir, The Wine Lover’s Daughter, Clifton Fadiman had a passion for high quality wine that complemented his passion for high quality books. Both “sparked conversation, they were both a lifetime project, they were both pleasurable to shelve, they were the only things he collected” (p.137). Wine for the senior Fadiman was a civilizing influence in life generally, and at mealtime in particular. Fadiman and his second wife, Annalee Whitmore Jacoby Fadiman, the author’s mother, shared at least half a bottle of wine every night for dinner, and for many years a full bottle. Her father, the younger Fadiman writes, “really believed that when he swallowed a great wine, he incorporated Western culture: an entire world of history, literature, art, and religion, straight down the esophagus” (p.11). Fadiman’s feelings about wine were “as religious as he ever got.” Wine drinking was akin to music or mysticism: “All three are in the end inexpressible by words.” (p.204-05). Her father became a wine aficionado, the younger Fadiman reveals, as a way to set himself apart from his lower middle class Jewish roots. Drinking wine was a trait her father associated with the life-style of upper class white Anglo-Saxon Protestants (WASP is the inimitable American acronym), precisely the life-style and pedigree to which he aspired. Intertwined with Fadiman’s need to transcend his Jewish background and secure a place at the WASP table was what we today might call “imposter syndrome,” in which individuals doubt their accomplishments and have a persistent internalized fear of being exposed as a fraud. Daughter Anne does not use this pop psychology term, but nonetheless emphasizes that her father, however successful he might have been, always felt himself to be an underachieving and undeserving outsider. 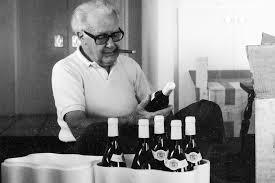 But the memoir is about more than Clifton Fadiman’s psyche and how and why wine fit into it. 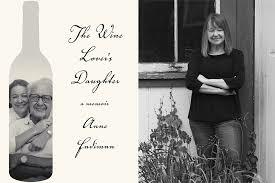 It is also very much about its author, Anne Fadiman, the wine lover’s daughter, today an eminent journalist and essayist who teaches non-fiction writing at Yale University. It seems implicit in her story that she never suffered from the outsider pangs that afflicted her father. And although she describes herself at one point in the memoir as “half-Jewish” (her mother came from a Mormon background), she does not reveal whether Judaism has any hold on her. But clearly Judaism didn’t mess up her mind the way it did that of her father. Rather, wine messed up her mind: her memoir is in substantial part an attempt to come to terms with an inability to appreciate wine in the manner of her father. Born in Brooklyn, New York in 1904, a “century before it became fashionable,” (p18-19), Clifton Fadiman was the son of Jewish immigrants. His father, who operated a drug store, came to the United States from Minsk, in today’s Belarus. His mother, a nurse, was from a village in Ukraine. Young Clifton learned to read at age 4. By age 14, he was digesting Sophocles, Dante, Milton and Melville. He became adept at “ambulatory reading,” reading while walking, and always seemed to have a book in front of his face as he grew up. Graduating from high school 2 ½ years early, Fadiman went on to study at Columbia University on Manhattan’s Upper West Side — “across the river,” as his family put it. As an undergraduate, he began writing reviews for The Nation and operated a bookstore in New York’s Penn Station. According to his daughter, he was “jubilant” when he received his first paycheck because he had refuted his parents’ long-held assumption that he would never find work when he grew up because “all he could do was read” (p.131). The elder Fadiman was acutely aware of his Jewishness growing up and, as daughter Anne observes, “simply could not imagine a time when being a Jew, or even a half Jew, was not a disability” (p.91). In one of the most telling illustrations of the obstacles that Jews of his generation faced, Fadiman was turned down for a faculty position in the Columbia English department on the sole and explicit ground that the department had room for only one Jewish member, and had chosen Lionel Trilling for the position. “My father never got over that moment” (p.88), the younger Fadiman writes. Trilling went on to become one of America’s most-revered literary critics (the subject of a short but incisive biography reviewed here in June 2012), and remained one of Fadiman’s life-long friends. Each, according to daughter Anne, secretly envied the other’s professional success. Fadiman first came to know the pleasures of wine drinking during a trip to France in 1927, at age 23, when America was still mired in Prohibition, its ill-begotten experiment with the banning of alcoholic beverages. From the beginning, his taste gravitated to high end Bordeaux and Burgundy vintages. Drinking wine on that trip to France, he later related to his daughter, “felt less like a new experience than like an old one that had been waiting all his life for him to catch up to it” (p.32). At age 28, as Prohibition was about to end, Fadiman became an editor-in-chief at Simon & Schuster. The position enabled him to start buying the high-end wine he had come to love. Fadiman was attracted to wine at this early age, his daughter Anne surmises, in no small part because wine “wasn’t Jewish” (p.78-79). The perception at the time was that Jews knew nothing about wine. While discovering wine as a young man, Fadiman also had a first marriage that produced a son, Jonathan, Anne Fadiman’s significantly older half-brother. Without using the term “imposter syndrome,” the younger Fadiman indicates that her father always felt like a man “admitted by mistake to a gentlemen’s club and, as soon as he is discovered, will be booted out the service entrance” (p.52). By any measure, her father “had it made. But he didn’t believe it” (p.51), preferring to think of his multiple professional accomplishments as his “so-called success” (p.56). She lists some of those accomplishments: Time Magazine called him the “smartest book reviewer in the country” (p.51); celebrity journalist and radio broadcaster Dorothy Thompson placed him ahead of all presidents, past and president, on her list of ideal dinner party guests; and, through the medium of television, he attained financial success beyond his wildest youthful dreams, “all the while cheerfully biting the hand that fed him by casting witty aspersions on the idiot box” (p.51). Nonetheless, “both at the peak of his fame and for the rest of his life, he considered himself an outsider” (p.52). It was only when he drank wine that he felt like he belonged, daughter Anne concludes. As he grew older, the senior Fadiman expanded modestly his preferences in wine, buying and enjoying bottles from California, Australia, Chile, Corsica and Greece. At age 88, he began to lose his vision, a disaster for a man whose life had turned on reading, and his daughter recounts how he learned to rely upon audio books. In her father’s adjustment to learning to be blind, he seemed to have “learned how to think of himself as a little less counterfeit” (p.180). Somehow her father retained his sense of taste, and wine was “as good as it ever had been, which made it better” (p.179). The memoir focuses less attention on the author’s mother, but she too was a formidable presence in her daughter’s life. Annalee Whitmore Jacoby Fadiman was 12 years younger than her husband, an agnostic ex-Mormon from a distinguished Utah family. It was a second marriage for both: her first husband died in a military accident six months after their marriage. She was a Stanford graduate, a former MGM screenwriter, a rare position for a woman in Hollywood in her era, and a reporter for Time-Life in China. She collaborated with renowned journalist Theodore White, who wanted to marry her, on Thunder Out of China, a widely read 1946 report on China’s on-going civil war. Not surprisingly, her second husband introduced her to wine, which she dutifully enjoyed in a “cheerful, unassuming, nothing-to-prove way” (p.77), although she had a preference for milkshakes. Anne Fadiman was the couple’s first child, born in 1953. Anne and her brother Kim, born two years later, spent their early years in Connecticut before the family moved to Southern California because, she writes, her mother thought California would transform her and Kim “from nerds with perpetually running noses into tall, tan, healthy in-crowders who knew how to surf” (p.13). By the time she was in the 6th grade, daughter Anne knew all the Bordeaux premier crus, plus a good cross section of Burgundy premier crus, and the years of exceptional Bordeaux vintages. She drank watered wine growing up, which she hated but assumed that “puberty would grant me a taste for Châteauneuf-du-Pape, along with a taste for French kissing and all the other things that ten-year-olds found disgusting but adults reportedly enjoyed” (p.6). But she never had her wine epiphany. By her early 30s, Anne was “well aware that the world was full of people who didn’t like wine, or didn’t care about wine, or didn’t know anything about wine, or never thought about wine.” Why, she asks, couldn’t she just be one of them? Because her father believed that there was “something actually wrong with people who did not love what he loved” (p.101-02). She knew that if she loved or even liked wine, “it would have made my father really, really, really happy” (p.103). But by the time she was in her late 40s, she had to admit to herself that she would never love or like wine. “There was no single moment when I gave up for good; my hope just sort of faded away” (p.181), she writes wistfully. After her father’s death, the younger Fadiman read an article about the technical nature of human taste buds, which prompted her to wonder whether wine was her blind spot “not because I was morally, emotionally, intellectually, or aesthetically deficient but because I was biologically deficient. That would get me off the hook, wouldn’t it? I’d be like someone who doesn’t enjoy reading not because she’s uncultivated but because she’s dyslexic” (p.187). She became fascinated with the notion of “supertasters,” for whom “salt tasted saltier, sugar tasted sweeter, pickles tasted more sour, [and] chard tasted more bitter.” Super tasters have lots more “fungiform papillae, the little mushroom-shaped bumps that house the taste buds” (p.188), she learned. Fadiman sought out the experts in the field. One, Dr. Utermohlen, concluded that although she had an extraordinary amount of papillae, it was not quite enough to make her a “super taster.” Her taste buds were at the level below, “highly sensitive,” which she interpreted as code for “pathetic taste in wine” (p.203). “So there it was,” she concluded. “I didn’t taste what my father tasted. This knowledge made me both happy and sad” (p.202). She wished she had met Dr. Utermohlen earlier. “I would have felt, if not completely exonerated, at least less convinced that my inability to appreciate wine was a character flaw” (p.202). But her similarly wine-indifferent brother Kim probably had a better explanation as to why he and his sister never came close to approaching their father’s love for wine: “Because we didn’t need to escape our origins” (p.206), he once told his sister. In his later years, the senior Fadiman worried that America was “descending into a phase similar to the Dark Ages, in which humanism would be replaced by technology” (p.126). He felt that the “world of WASP cultivation he had worked so hard to master” had “slipped through his fingers and been replaced by vulgarity and ugliness” (p.124). 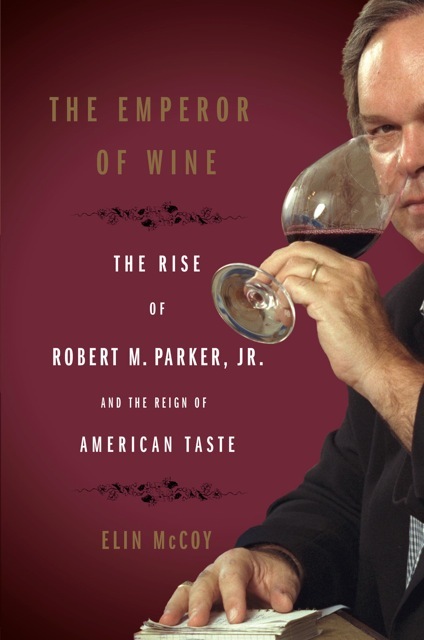 But by Fadiman’s last decade, wine in the United States had ceased to be the province of stuffy WASP elites, if it ever was: people of all stripes and social classes regularly enjoyed a glass or two of wine, with meals and as an aperitif, and American wine-making had come up to the level of the best of the world. Overall wine consumption in the United States by then exceeded that of France (although not on a per capita basis). What were the senior Fadiman’s views on this transformation in American wine consumption and production patterns? Did he cheer them as appropriate examples of democratizing the dinner table, or bemoan them as further affirmation of the vulgarity and ugliness of American culture? We don’t find out here. And did Fadiman in his later years have any thoughts about whether being Jewish still presented the obstacles to personal and professional success that he had encountered as a young man? Anti-Semitism remains a force still to be reckoned with in the United States, as the synagogue shootings in Pittsburgh last October brutally reminded us. But by the time Fadiman’s two children from his second marriage graduated from Harvard in the 1970s, Jews were freely moving into almost all echelons of American society. How did Fadiman view these changes in social and professional mobility for American Jews of his children’s generation? Again, we don’t find out here. I further wondered what Fadiman thought as he grew older about changing American reading habits. Was he able to see what the Internet, which was just taking off in his final years, portended for the consumption of serious literature? But the question which gnawed most at me as I finished this affectionate, entertaining, and often-funny memoir is perhaps outside its scope: is there is a 21st century Clifton Fadiman out there today, gently steering middle brow Americans to the pleasures and virtues of good reading? If there is, I’ve missed him or her.